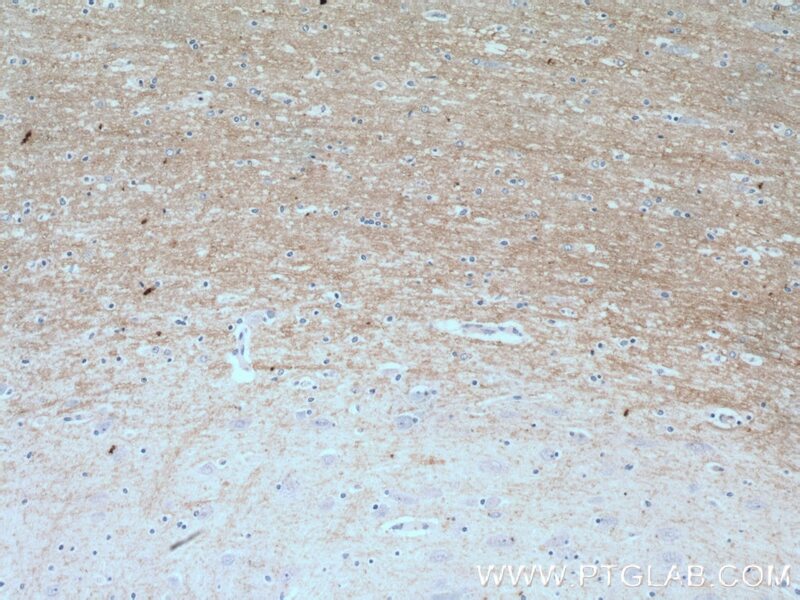 Immunohistochemical analysis of paraffin-embedded human brain tissue slide using 12690-1-AP( MOG Antibody) at dilution of 1:100 (under 10x lens). 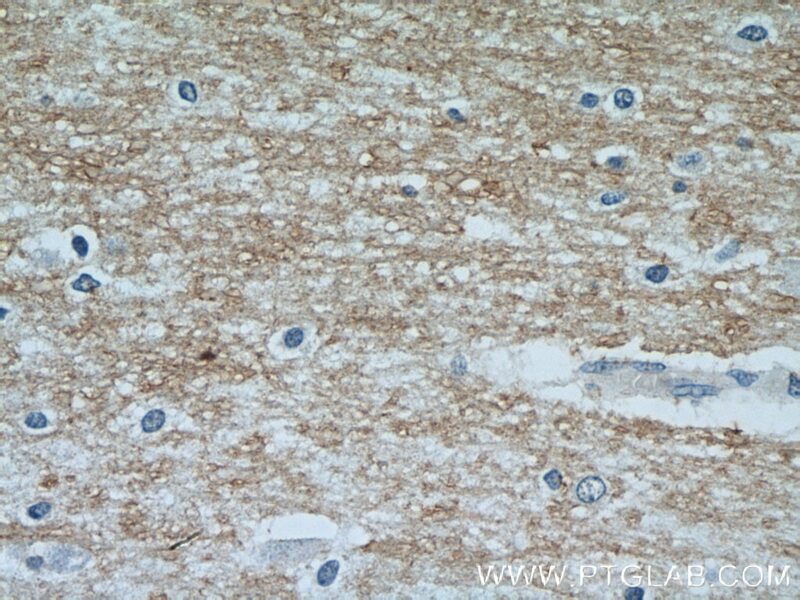 Immunohistochemical analysis of paraffin-embedded human brain tissue slide using 12690-1-AP( MOG Antibody) at dilution of 1:100 (under 40x lens). Myelin/oligodendrocyte glycoprotein (MOG), a 23-to 28-kDa glycoprotein, a myelin antigen at the outer surface of the central nervous system (CNS) myelin sheath, which may trigger T-cell as well as B-cell responses. It therefore constitutes a pivotal target for autoimmune responses, which result in inflammation and also demyelination in the CNS. Its presence on the outer- most lamellae of mature CNS myelin and its late appearance during myelinogenesis suggest that it contributes to myelin maturation or maintenance. 10 isoforms of MOG produced by alternative splicing have been described, and heterodimers may be formed between the different isoforms. Defects in MOG are the cause of narcolepsy type 7 (NRCLP7), a neurological disabling sleep disorder characterized by excessive daytime sleepiness, sleep fragmentation, symptoms of abnormal rapid-eye-movement (REM) sleep, cataplexy, hypnagogic hallucinations, and sleep paralysis. Role of MOG in the pathogenesis of multiple sclerosis (MS) has been reported but remains to be clarified. Identification of the myelin oligodendrocyte glycoprotein as a cellular receptor for rubella virus. Galactolipid deficiency in the early pathogenesis of neuronal ceroid lipofuscinosis model Cln8mnd : implications to delayed myelination and oligodendrocyte maturation.